Over the last three decades, Roulette has been at the forefront of innovation and experimentation. 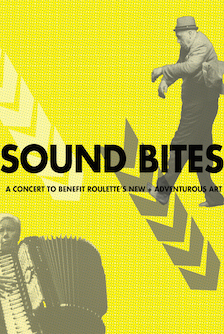 Sound Bites, our annual benefit concert, salutes 36 years of presenting and supporting New + Adventurous Art with five select performances by artists working in music, dance and Intermedia. Ha-Yang Kim: Kim’s 2015 Artist Residency debuted TERMINALS, a full-length meditative audiovisual work on the peripatetic quality of contemporary life with multimedia artist, Ursula Scherrer. TIGUE: Acclaimed as “one of the premier young percussion-based groups in Brooklyn right now” (Dayton City Paper), this percussion-charged trio released their debut full-length album “Peaks” in Fall 2014. Rinde Eckert: Having recently performed in Fall 2014 with Ruth Zaporah as part of [DANCEROULETTE], Eckert is a total theater artist − a writer, composer, librettist, musician, performer and director who’s been active since the 1980s. Oliver Lake: A prolific performer and “explosively unpredictable soloist” (All Music), Lake’s bluesy and piercing saxophone sound is his trademark. Pauline Oliveros: A senior figure in contemporary American music, Oliveros’ career spans fifty years of boundary dissolving music-making.